This salad came about because, here in January, I couldn’t stand not eating tomato any longer. Enter Fresh Direct. They tempted me with a beefsteak tomato – that while fairly costly, was actually fresh and actually tasted like tomato. Not sure if it was hot house (there was no mention in the description and it certainly didn’t taste like it), magic fairy house, or teleported from somewhere warm – but it was delicious. Just the breath of warm I was craving. I ate this for lunch on my second day of Whole30 Take 2 – and didn’t feel deprived in the least. Supreme (cut off the outer rind and slice out each wedge individually – for video instructions, click here) your orange and cut the pieces into bite-sized chunks. Cut the tomato into bite-sized chunks. Warm your pork if needed. 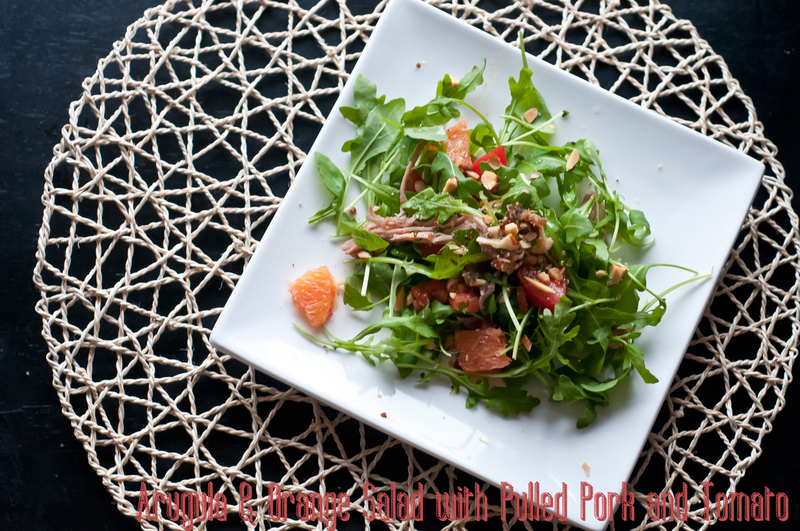 Chuck the arugula, pork, tomato and orange into a big bowl and toss to combine. Sprinkle with gremolata, the juice from the orange middle, and grapeseed oil.